This month I celebrated my 60th birthday. For many, this can be a tough one. Fortunately, I have known some inspirational elders who have helped shape my views on aging. Both my parents and my wife Bonnie’s parents made it into their 90s after building an impressive collection of stories both before and after age 60. Each kept growing and contributing after 60 with amazing productivity and impressive style and grace. For them, getting older meant liberation, growth, and new discovery. For others, aging has become a single story dominated by the word decline. “Aging equals decline” is one of many examples of the single defining story I’ll resolve to debunk and retire within this blog. 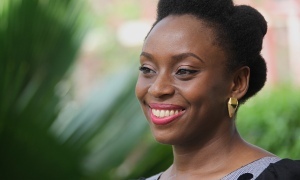 I’ve invited authors H. L. Mencken, Chimamanda Adichie (pictured above), and Malcolm Gladwell to join me in this crusade. Each of us occupies both the giving and receiving end of single stories. We have good intentions. We want to be decisive and clear, but are too often guilty of spreading simple messages to explain complex realities. Journalist H. L. Mencken once wrote, “For every complex problem there is an answer that is clear, simple, and wrong.” Watch this TED Talk by Nigerian author Chimamanda Adichie for an illustration of how easy it is to fall into the single story trap, the damage it can cause, and ways to avoid this mistake. Out of step, out of date, out of shape are phrases often attached to those of us “of a certain age”. Many of my clients have complained of being trapped inside this “old” story, while others have successfully created multiple messages that reveal the best of growing older and wiser. One of the best bits of advice I have heard for job seeking after age 50 came from a Fortune Magazine article from the late 1990s that offered two very useful suggestions, “Stay current, and stay in shape.” Sounds like another good New Year’s resolution, wouldn’t you agree? Whether we are being evaluated or are evaluating others, now is a good time to consider how open we are to the larger, more layered story about us and about others. If we are experiencing, or perhaps unknowingly perpetuating, agism, racism, sexism, or any form of prejudice or unfair stereotyping, let’s see if we can make the story less simple, less singular, and more generous, varied and kind. Consider these two quotes from the 2005 Malcolm Gladwell book, Blink: The Power of Thinking Without Thinking. As this year comes to an end, with recurring themes of unrest and growing racial tension, let us each consider how open we are to the more expansive stories about each other. Let us vow to listen more carefully with both our ears and our hearts. Let us commit to hearing the fuller story that others wish to tell us, not just the parts that reinforce what we think we already know about them. Let us not just seek and illuminate the simple facade, but reveal instead both the book’s cover and the rich and varied chapters within. In other words, let us evaluate others in the ways in which we ourselves wish to be evaluated. Here’s to a great year ahead for you and all those surrounding you. Let’s resolve to greet 2015 with open minds and open hearts. This year, no more single stories.